"Bon Agornin writhed on his deathbed, his wings beating as if he would fly to his new life in his old body. The doctors had shaken their heads and left, even his daughters had stopped telling him he was about to get well. He put his head down on the scant gold in his great draughty under-cave, struggling to keep still and draw breath. He had only little time left, to affect everything that was to come after. Perhaps it would be an hour, perhaps less. He would be glad to leave the pains of flesh, but he wished he had not so much to regret." Summary: Five dragon siblings have gathered at their father's deathbed, for a goodbye and later, to eat his body, as is custom. While Blessed Penn hears his father's startlingly scandalous final confession, the maidens Selendra and Haner wonder about their foggy future with no guardian. Avan is curious about his share of the inheritance and Berend, the eldest sister, visits with her children and her pompous dominating husband Illustrious Daverak, who isn't concerned about anything but his share of dragon-meat, which gives one a renewed vitality. But the siblings need both the strength and the honour of eating their father. When Daverak eats more than his intended share, Avan seeks revenge, or justice... in court! Which is not to say that dragons don't duel, it's just, Avan is more proper... and, more importantly, much smaller. In the world of dragons, when a suitor approaches a female dragon, she blushes, and her golden scales turn pink. A maiden is not a maiden anymore when she is coloured a bridal pink. So when, the next day, a male-dragon places his claw on Selendra's shoulder, she blushes, even though she refuses his brazen proposal. While she fixes her blush with a potion, Selendra is unsure if she can ever turn pink again. As Selendra and Haner, who are clutch-mates, face going their separate ways - Selendra to live with Blessed Penn's family and Haner to live with Berend and Daverak - they make a pact: since they have only enough dowry for one, neither will marry unless her sister's approves of her husband. But, of course, they both fall inevitably in love. 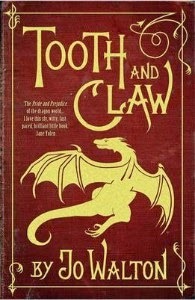 My thoughts: Tooth and Claw by Jo Walton is a Victorian-style novel about class politics, religion, money and endless proposals, a Pride and Prejudice with dragons, as a blurb appropriately calls it. And it's brilliant. The ways of the dragons and their intricate customs, so close to ours and yet so different, the genius exaggeration, reminded me of the rabbit culture of Watership Down by Richard Adams. But it's a much more proper society in Tooth and Claw: they have their city businesses and country farms, new churches and secret old churches, they have trains and carriages, because servants and parsons have their wings bound and cannot fly, they have dragons working for the liberation of those in servitude and they have the self important men, who feel it's their right and duty to decide just what the silly women do. It's a horrible world. But then there are luncheons and parties, and a lot of gold and treasure, which the fifty-foot dragons lay down in their caves to sleep on, the dragons wear hats and bows and go to school, which is hilarious. As are the chapter titles, where the narrator keeps track of the number of proposals, deathbeds and confessions. The characters, especially the women, are well written and realistic - Berend seems to have forgotten to be herself, while Selendra is rebelliously self assured and my favourite was Penn's wife Felin, who is a supportive wife and mother, but doesn't hesitate to go out of her way to do something she knows is right. It's clear her compromises serve better than either extreme, Berend or Selendra. I like that the author hasn't tried to impose any views on us, only giving us glimpses into her world. It's a nice story, with a very happy ending you know you're going to get, even though Walton throws in a few twists and surprises. Even the most difficult misunderstandings and fights are smoothed out and everything falls into place at the end. It makes you smile, but because the book is so small, it does also make you wish there were more, a deeper look at the problem, a less coincidental resolution. It seems like a first book in a series, almost incomplete, and so far there hasn't been any sequel. It's not a perfect book, it could have been better, but Tooth and Claw by Jo Walton still makes an engaging and amusing read! And I do want to try another book by the author. This was my seventh (or was it sixth?) read for the Once Upon a Time challenge. I've only read two books by Walton, loved Farthing, but didn't find Among Others that great. I like that this one would work for the OUaT challenge! So glad you reviewed this. I just read Among Others, and liked it a lot (not perfect, but still) and I want to try Tooth and Claw. I also read Farthing and the other two books in that series and loved it. But I do read mainly mysteries and those books fall in that genre also.